Heat the strawberries, sugar and water in a 10-inch skillet over high heat to a boil. Cook on high for 10 minutes or until the strawberries are very soft and the liquid is reduced to a syrupy consistency. Remove the skillet from the heat and let the compote cool. Beat the eggs and milk in a shallow baking dish. Heat 1 tablespoon butter in a 12-inch nonstick skillet over medium heat. While the butter is heating, place 4 bread slices into the egg mixture and turn to coat. Cook the coated bread slices for about 2 minutes on each side or until golden brown. Repeat with the remaining butter and bread slices. 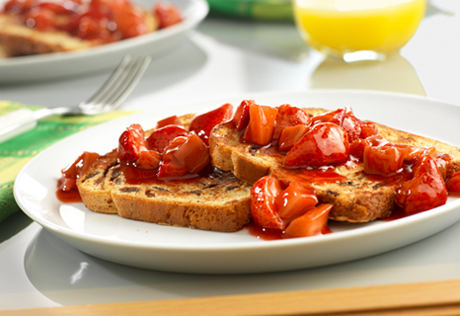 Serve with the strawberry compote. For a lemony twist, stir 1/2 teaspoon grated lemon zest and 1 teaspoon lemon juice into the cooled strawberry mixture.